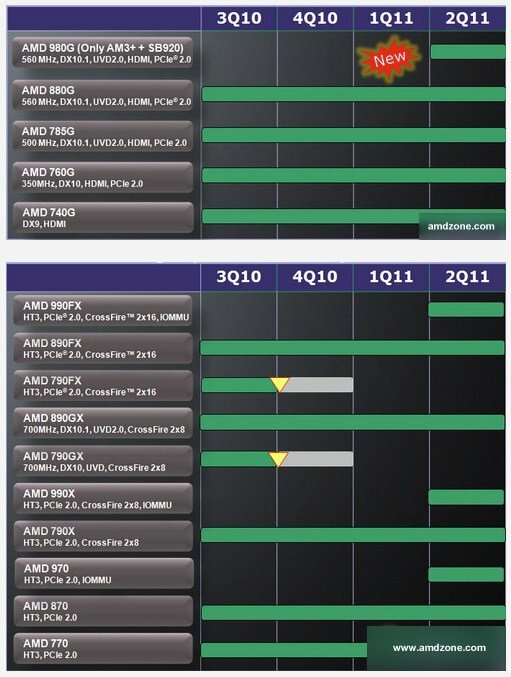 New slides appeared on the web at the AMD zone forum details new chipsets plans until Q2-2011 , the "Bulldozer" architecture based processors which use the new socket type, the AM3+ , the slide inform us that AMD will launch new northbridges and southbridge setup in addition to more specifications tables leaked about the new chipsets. The new northbridges chipsets are 980G, 990FX, 990X and 970 , the new southbridge are SB950 and SB920 . The specification table show us that the SB950 southbridge will support the SATA 6.0Gb/s and support for RAID 5 mode.